Do you want to burn fat with only 5 exercises? This 5 exercise routine is great for fat loss and toning. It’s designed to help you build a rock solid core, burn fat and improve your sports performance. 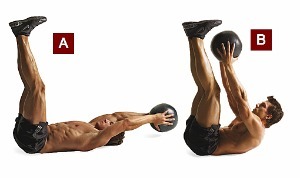 The best part: All you need is a medicine ball to do this workout any place, any time. Perform this routine 3 days a week. 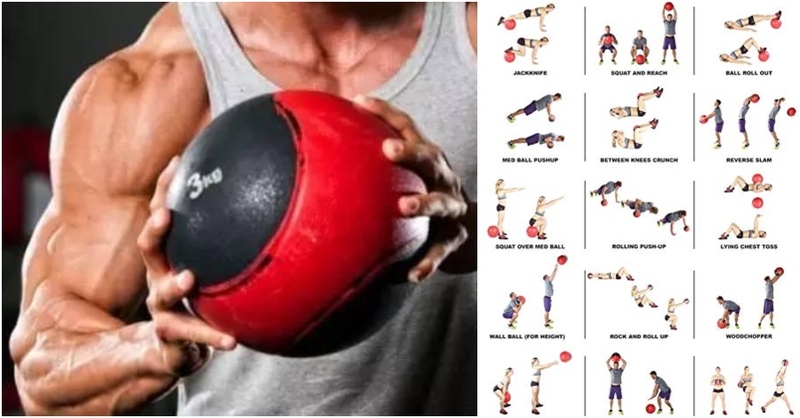 Use a 3kg, 4kg or 5kg medicine ball. Do 20 reps of each exercise in the order shown. Complete the routine as a circuit, doing 1 set of each movement in succession and without resting. Sit on the floor with your legs straight and hold the ball with both hands just above your lap [A]. Twist your torso to the right and place the ball behind you [B]. Then twist all the way to your left, pick up the ball, and bring it back to the starting position [C]. After this, immediately do another 10, this time by twisting with the ball to your left. Grab the ball, lie on your back and raise your legs so they’re straight and perpendicular to the floor. Hold the ball above the top of your head with your arms straight [A]. Without moving your legs or bending your elbows, simultaneously lift your arms and torso until the ball touches your toes [B]. Grab the ball and sit on the floor. Lean back at a 45-degree angle, raise your legs off the floor and hold the ball with both hands in front of your chest, your arms straight [A]. 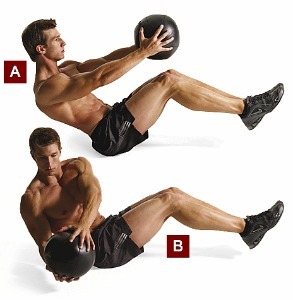 Without dropping your legs or arms, rotate the ball and your torso as far as you can to the right [B]. Then rotate to the left. Use both hands to hold the ball above your head and barely off the floor [A]. Simultaneously raise your torso and bend your right knee towards your chest, as you bring the ball over your knee and towards your foot. Repeat but reverse the movement, this time bending your left knee [B]. Grab the ball and lie on the floor with your legs straight and spread wide. Roll onto your right hip and hold the ball with your arms straight at 10 o’clock, above the top of your head [A]. Then raise your arms and torso, and touch the floor with the ball between your legs [B]. Lower your body, but instead of rolling back onto your right hip, roll onto your left and hold the ball at 2 o’clock above your head [C], before repeating the movement.